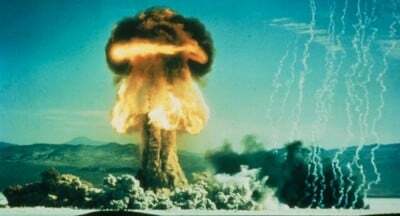 Declassified Documents Reveal Pentagon’s 1950s Planned Nuclear Holocaust: “Systemic Destruction” and Annihilation of Prague, Warsaw, Budapest, Moscow, Beijing, …. More than 1000 Cities. Publicly available military documents confirm that pre-emptive nuclear war is still on the drawing board of the Pentagon. Compared to the 1950s, the nuclear weapons are more advanced. The delivery system is more precise. In addition to China and Russia, Iran, Syria and North Korea are targets for pre-emptive nuclear war. Let us be under no illusions, the Pentagon’s plan to blow up the planet using advanced nuclear weapons is still on the books. Should we be concerned? Blowing up the planet through the use of nuclear weapons is fully endorsed by presidential candidate Hillary Clinton, who believes that nuclear weapons are instruments of peace-making. Her campaign is financed by the corporations which produce WMDs. The people at the highest levels of government who make the decision regarding the use of nuclear weapons haven’t the foggiest idea as to the implications of their actions. Recently-declassified nuclear targeting documents from 1959 describe how Washington planned to obliterate the capital cities of what are now America’s NATO allies in Eastern and Central Europe. The revelation casts doubt on Washington’s Cold War commitment to the protection of what it referred to as «captive nations» in Europe. The documents are contained in a report titled, «SAC (Strategic Air Command) Atomic Weapons Requirements Study for 1959». The US Air Force study called for the «systematic destruction» of such major population centers as Warsaw, East Berlin, Prague, Bucharest, Tallinn, and others, as well as Peiping (Beijing), Leningrad (St. Petersburg), and Moscow. Atomic bombs eight times to destructive force of that dropped by the United States on Hiroshima were trained on a number of targets in Moscow and St. Petersburg. There were 179 «designated ground zeros» for atomic bombs in Moscow and 145 in St. Petersburg. US atomic weapons would have laid waste to Wittstock, just upwind of German Chancellor Angela Merkel’s hometown of Templin in Brandenburg in the former East Germany. It is most certain that had the US launched an atomic attack on Europe, Merkel, her parents Horst and Herlind Kasner, and brother Marcus would have been vaporized in the massive pre-targeted strike on East Berlin and the regions surrounding it. Budapest would have been completely destroyed after the US hit the Tokol military airfield on the banks of the Danube River with one of its «city-busting» nuclear weapons. The blast would have rendered the Danube a radioactive drainage ditch and anyone exposed to the poisonous Danube waters downriver would have succumbed to an agonizing death from radiation sickness. Adding to the misery of anyone living alongside the Danube was the fact that Bratislava, also on the banks of the Danube, was also targeted for nuclear annihilation. The first major urban center casualties outside of Hungary and then-Czechoslovakia from the radioactive Danube would have been in Belgrade, the capital of neutral Yugoslavia. The nuclear targeting of Vyborg on the Finnish border would have brought death and destruction to the border region of neutral Finland. Four atomic bombs were targeted on the former Finnish city: Koyvisto, Uras, Rempeti airfield, and Vyborg East. Nuclear weapons, as the United States knew in 1959 and very well knows today, are not «precision-guided munitions». For all of its propaganda beamed to Eastern Europe on Radio Free Europe and Radio Liberty, the United States was willing to sacrifice the very peoples it proclaimed to want to «free» from the Soviet bloc. America’s «mutually assured destruction» policy was based on increasing the «mega-death» count around the world by having the ability to hit the enemy with more nuclear «throw weight». Increasing the mega-death count was why the United States targeted such large population centers as Peiping (Beijing), Shanghai, Mukden (Shenyang), and Tientsin in China. The pummeling of metro Moscow with atomic bombs was also designed to increase body count. The formerly Top Secret nuclear targeting document lists the following areas of Moscow for nuclear bombardment: Bykovo airport, central Moscow, Chertanovo, Fili, Izmaylovo, Khimki, Kuchino, Lyubertsy, Myachkovo airport, Orlovo, Salarevo, Shchelkovo, and Vnukovo airport. Eighteen nuclear targets were programmed for Leningrad: Central Leningrad (including the historic Hermitage), Alexandrovskaya, Beloostrov, Gorelovo, Gorskaya, Kamenka North, Kasimovo, Kolomyagi, Kolpino, Krasnaya Polyana, Kudrovo, Lesnoy, Levashovo, Mishutkino, Myachkovo, Petrodvorets, Pushkin, Sablino, Sestroretsk, Tomilino, Uglovo, and Yanino. Bucharest, Romania, was the target for three city busters aimed at Baneasa, Otopeni airport, and Pipera. Ulan Bator, the capital of the present America-idolizing Mongolia, would not have been spared. The Pentagon nuclear target list does not even list Mongolia as a separate country. The entry for the nuclear strike reads: «Ulaan Baatar, China». Two uncomforting facts stand out from the disclosure of the targeting list. 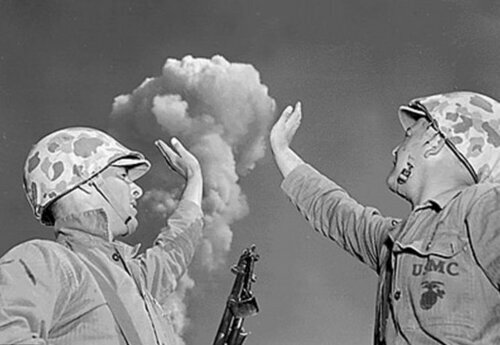 First, the United States remains as the only country in history that used nuclear weapons in warfare – hitting the Japanese cities of Hiroshima and Nagasaki in 1945. Second, some Pentagon officials, notably Air Force Chief of Staff Curtis LeMay and Chairman of the Joint Chiefs of Staff Lyman Lemnitzer, called for a nuclear first strike on the Soviet Union and its Warsaw Pact allies. 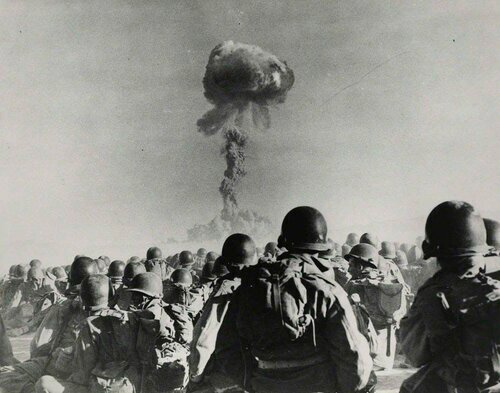 In fact, while the USSR, China, and France rejected the first use of nuclear weapons, NATO and the United States, on the other hand, chiseled in stone the first use of tactical nuclear weapons in the event of a Soviet invasion of Western Europe. But, as seen with the wishes of LeMay, Lemnitzer, and others, a massive pre-emptive nuclear strike on the Soviet Union and its allies, including China, was on the wish list of the Pentagon’s top brass. Because the Soviet Union had virtually no intercontinental ballistic missiles (ICBMs) in 1959 and hinged its nuclear warfare capabilities on strategic bombers, the Pentagon brass wanted to hit the Soviet Union in a pre-emptive strike before they reached missile parity with the United States. At the heart of the crazed Pentagon reasoning was what the nuclear warfare champions called the «missile gap». There is not much of a leap from the «black comedy» nuclear Armageddon film «Dr Strangelove» to actual Cold War era meetings on pre-emptive nuclear strikes held in the White House and Pentagon. Attorney General Robert Kennedy walked out of one such meeting in disgust while Secretary of State Dean Rusk later wrote: «Under no circumstances would I have participated in an order to launch a first strike». In 1961, President John F Kennedy questioned the motives of his generals and admirals after one such nuclear war pep talk from the Pentagon brass by stating, «And we call ourselves the human race». Kennedy and his brother Robert had every reason to be fearful that the Pentagon would circumvent civilian authority and launch a nuclear strike either against Cuba, the Soviet Union, or both during the 1962 Cuban Missile Crisis. According to Nikita Khrushchev’s memoirs, Robert Kennedy told Soviet ambassador to Washington Anatoly Dobrynin during the height of the crisis that «the President is not sure that the military will not overthrow him and seize power. The American military could get out of control». Today, the peoples of Central and Eastern Europe continue having their love affair with NATO and the Americans. Yet, it was the same NATO and the forefathers of the present gung ho military interventionists in Washington who once wanted to rain nuclear fire upon the cities of Warsaw (six ground zeroes: Ozarow, Piastow, Pruszkow, Boernerowo, Modlin, and Okecie), Prague (14 designated ground zeroes at Beroun, Kladno, Kralupy nad Vltavou, Kraluv Dvor, Neratovice, Psary, Radotin, Roztoky, Slaky, Stechovice, Velvary, Kbely, Ryzyne, and Vodochody), Budapest, Bucharest, Sofia (three ground zeroes: Bozhurishte, Kumaritsa, and Vrazhdebna), Bratislava, Kiev (three nuclear targets: Bortnichi, Post-Volynskiy airport, and Svyatoshino airport), Leipzig (where seven atomic bombs were targeted on Altenhain, Boehlen, Delitzsche, Grimma, Pegau, Wurzen, and Brandis), Weimar, and Wittenberg. Also not to be spared nuclear annihilation were Potsdam, Vilnius (five nuclear ground zeroes: Novo Vilnya, Novaya Vileyka, Vilnyus (Center), Vilnyus East, and Vilnyus Southwest), Lepaya (Latvia), Leninakan (Gyumri) in Armenia, Alma Ata (Kazakhstan), Poznan, Lvov (three ground zeroes: Gorodok, Lvov Northwest, and Sknilov), Brno, Plovdiv in Bulgaria, Riga (four ground zeroes: Salaspils, Skirotava, Spilve, and Riga West), Ventspils in Latvia (two targets: Ventspils South and Targale), Tallinn (two ground zeroes: Lasnamae and Ulemiste), Tartu, Tirana, Vlone (Albania), Berat/Kucove (Albania), Kherson (Ukraine), Baku/Zabrat, Birobidzhan in the Jewish Autonomous Republic, Syktyvkar in the Komi Autonomous Republic, Nakhichevan Autonomous Republic on the Iranian border, Osh in Kyrgyzstan, Stalinabad (Dushanbe) in Tajikistan, Tashkent in Uzbekistan, and Tbilisi (seven ground zeroes at: Tbilisi central, Agtaglya, Orkhevi, Sandar, Sartichala, Soganlug, and Vaziani). NATO and neo-conservative propagandists continue to paint Russia as an enemy of the peoples of central and eastern Europe. However, it was not Russia that had nuclear weapons once trained on the cities of the Eurasian land mass but the United States. Had the Pentagon generals and admirals had their way, today the eastern front of a rapidly expanding NATO would have been nothing more than a smoldering and radioactive nuclear wasteland, all courtesy of Uncle Sam’s nuclear arsenal.